On July 15, federal district court judge John Koeltl sentenced radical civil liberties lawyer Lynne Stewart to ten years behind bars. For 70-year-old Stewart, who has been fighting breast cancer, this could be “a death sentence,” her husband Ralph Poynter said after the judge’s decision. More generally, the effect and intended result of this draconian decision will be to initimidate lawyers from vigorously representing defendants in the imperialist “war on terror.” The whole purpose of the prosecution’s case was to make an example of Stewart. 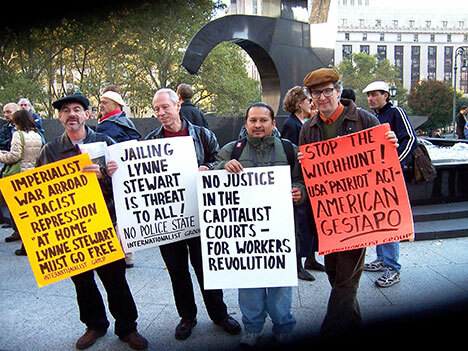 From start to finish, the persecution of Lynne Stewart has been a major step in the direction of a police state in the United States. Stewart is not a criminal, much less a “conspirator”or “terrorist,” but a fighter for the oppressed who has been targeted by a criminal and terrorist conspiracy, the United States government. All defenders of democratic rights must join in demanding, “Free Lynne Stewart!” Her translator Mohammed Yousry and paralegal Ahmed Abdel Sattar, who were convicted along with her in the frame-up trial, should also be freed. In 2005, the same Judge Koeltl sentenced Stewart to 28 months in prison for the same supposed “crime” of violating “Special Administrative Measures” (SAMs) imposed on her client, the Islamist cleric Sheik Abdel Rahman. 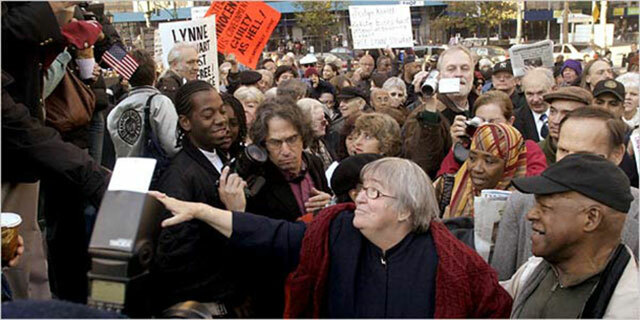 The conviction itself was an abomination and a frontal assault on democratic rights, upholding the government’s “right” to hold prisoners incommunicado by administrative fiat, and then to enforce the gag order by jailing their lawyers for “violating” the ban (see “Lynne Stewart Conviction Is Legal Terror,” The Internationalist No. 21, Summer 2005). But last November, a federal appeals court in a virtually unprecedented action ordered Koeltl to “reconsider” his sentence in light of the “terrorism enhancement” that allows courts to impose a maximum sentence, in this case of 30 years, and ordered Stewart immediately jailed, despite a pending surgery – all for violating an arbitrary administrative order of the U.S. Bureau of Prisons! The whole case against Stewart was cooked up in order to apply the “terrorism” ploy to lawyers and the courts generally. It was considered necessary to “synchronize” (Gleichschaltung, in Nazi German) the American legal system to the demands of the post-9/11 era. The indictment was announced with great fanfare by Attorney General John Ashcroft in early 2002, shortly after the USA PATRIOT Act curtailing civil liberties was rammed through Congress following the September 2001 attack on the World Trade Center and Pentagon. The tabloids and right-wing talk radio shows labeled Stewart a “terror lawyer” and “traitor.” The resentencing was intended to make sure that she is treated as a “terrorist.” Stewart was charged with providing “material support” to a conspiracy to commit murder in another country, and the fact that there was no evidence that anyone was killed or even harmed as a result of her actions was ruled irrelevant. The reason for existence of this case was sheer intimidation, and to regiment the population for war. Like the arrests of radical syndicalists and socialists on sedition charges in World War I, the jailing of the Trotskyists and Minneapolis Teamsters in World War II and the execution of Julius and Ethel Rosenberg at the onset of the anti-Soviet Cold War, domestic witchhunts are an integral part of imperialist war. They go hand in hand with the mass deportations and jailing of immigrants in concentration camps, going after the “enemy within.” In fact, one of the judges on the Second Court of Appeals panel, John Walker, was so incensed at the “breathtakingly low” and “extraordinarily lenient” initial sentence that he practically called for jailing trial judge Koeltl for aiding a conspiracy to aid a conspiracy. Judge Walker, a first cousin of former U.S. presidents George H.W. Bush and George W. Bush, would have done well in the Third Reich. But it’s also worth noting the role of the Democrats. Various liberal and reformist socialist commentators have made much of the fact that Bill Clinton’s attorney general, Janet Reno, could have prosecuted Stewart but didn’t, considering her transgression a minor infringement of the SAMs. But Judge Koeltl, who just handed down the ten-year sentence, was himself appointed to the federal bench by Bill Clinton. It was also the Clinton administration (via AG Reno) that imposed the Special Administrative Measures in the first place, and that in 1996 put in place the “terrorism enhancement” provisions under which the radical lawyer was given a virtual death sentence. The fact is that Lynne Stewart was tried and sentenced by a Clinton judge, for violating Clinton administration edicts, and had her prison time nearly quintupled under a Clinton decree. And on July 15 it was a prosecutor for the liberal Democratic administration of Barack Obama who argued the government’s case against Stewart.